Not to be confused with Australia national rugby league team. "Australian Wallabies" redirects here. For other uses, see Wallaby (disambiguation). This article is about the men's team. For the women's team, see Australia women's national rugby union team. A test match in rugby union is an international match, usually played between two senior national teams, that is recognised as such by at least one of the teams' national governing bodies. The Wallabies also compete annually in The Rugby Championship (formerly the Tri-Nations), along with southern hemisphere counterparts Argentina, New Zealand and South Africa. They have won this championship on four occasions. Australia also plays Test matches against the various rugby-playing nations. More than a dozen former Wallabies players have been inducted into the World Rugby Hall of Fame. The squad that went on tour in 1908–09. The First World War had a very negative effect on rugby union in Australia. All rugby union competitions in New South Wales and Queensland ceased after the state bodies decided it was inappropriate to play football when so many young men were fighting overseas. The sport of rugby union was all but closed down causing many players to switch to rugby league – which did not cease playing during the war. After returning from the successful European tour, Australia hosted the New Zealand Maori in a three match series in 1949; both sides winning once, with one draw. In September of that year, Australia played the All Blacks twice in New Zealand, winning both games and taking back the Bledisloe Cup for the first time on New Zealand soil. The 'Number 1' All Black side was touring South Africa at the time and the wins by Australia against the B-team have sometimes been downgraded. However, in deference to the apartheid system then in operation in South Africa, the NZRU did not select any Maori players for the tour. Many of those regular All Black Maori played against Australia instead and it could be said that the New Zealand team that played Australia was at least as good as the one on tour in South Africa. The British Isles toured Australia in 1950, and won both of the Tests against Australia. The following year Australia fell to a three Test whitewash to the All Blacks. Australia won in July 1952, defeating Fiji at the Sydney Cricket Ground – they then lost the second Test to Fiji by two points. Australia managed to beat the All Blacks at Lancaster Park after the Fijian series; however they lost the second Test. On this tour they also drew against Rhodesia in Kitwe 8–8. The first match of the new decade was the win over Fiji at the SCG in the first match of a three Test series during 1961. This was followed by a second win, but Fiji grabbed a draw in the third Test. Australia then headed to South Africa, where they lost to the Springboks in Port Elizabeth and Johannesburg. After returning home, they faced France at the SCG, who beat them 15–8. In 1962, Australia played the All Blacks five times and lost all but a 9-all draw at Athletic Park. After defeating England 18–9 in 1963 in Sydney, Australia beat the Springboks in consecutive Tests in South Africa; the first team to do so since the 1896 British team. Fewer tests were played throughout the mid-1960s, with Australia only playing a three Test series against All Blacks in 1964. They won the third Test after losing the first two. The following year Australia hosted the Springboks for two Tests, winning 18–11 and 12–8. This was their first ever series win over South Africa and first over a major nation since 1934. The British Isles came the following year, beating Australia 11–8 at the SCG, before hammering them 31–0 in Brisbane. Australia left for Europe in that December where a 14–11 victory over Wales was followed by a slim 11–5 defeat of Scotland. The tour continued into the following year where Australia beat England 23–11 before losing to Ireland 15–8 and France 20–14. Australia then hosted Ireland, who beat them again in Sydney. This was followed by a 20-point loss to the All Blacks. The following year, Australia lost to the All Blacks by just one point, and defeated France by the same margin for their last win of the decade. After losing to Ireland and Scotland on tour, Australia hosted Wales who also beat them. Australia played Scotland in 1970 and won by 20 points. The 1971 South African tour of Australia took place the next season. Protests were held around Australia and in Queensland a state of emergency was issued in advance of one of the Tests. Australia toured France in November of that year; defeating France in Toulouse, but losing the second Test in Paris. France then visited Australia in June 1972 and played a two Test series where they won one and drew one. Australia then played three Test series against the All Blacks in New Zealand—losing all three. They then stopped over in Suva to play Fiji on their return, where they won their only Test of the year. The following year, Australia hosted Tonga, and after winning the first Test, they lost 11–16 at Ballymore in their second. Australia also had a short tour of the United Kingdom in November 1973 where they lost 24–0 to Wales, and 20–3 to England. In 1974, Australia hosted the All Blacks for a three Test series—losing two, but drawing in Brisbane. In 1975 Australia defeated England in a two Test series at home. Australia then played Japan for the first time; beating them by 30 points in the first of two matches, and then winning 50 to 25 in the second. They then travelled to the Northern hemisphere for matches against Scotland and Wales where they were not able to score a try in either of their losses. The tour of Britain and Ireland continued into 1976, and Australia lost to England at Twickenham, but were able to defeat Ireland at Lansdowne Road. On their way home Australia played one more match—in Los Angeles against the United States. Australia won 24–12. In June of that year, Australia hosted Fiji for a three Test series and won all three. Australia finished the year with their tour of Europe where the team played two Tests against France in France, but lost both of them. There were no Wallaby tests played in 1977. Wales toured Australia in 1978, and Australia beat them 18–8 at Ballymore, and then again by two points at the SCG. This was followed by a three match series with the All Blacks. Although New Zealand won the first two, Australia defeated them in the last Test at Eden Park with Greg Cornelsen scoring four tries. The following year Ireland visited Australia and defeated Australia in two Tests. Following this Australia hosted the All Blacks for a single Test at the SCG which Australia won 12–6. Australia then left for Argentina for two Tests. After going down 24–13 in the first, Australia finished the decade by beating Argentina 17–12 in Buenos Aires. In 1980 Australia won the Bledisloe Cup for only the fourth time—defeating New Zealand 2–1 in a three match series in Australia. This was the start of a successful era for Australia. In 1984 Australia toured the Home nations with a young side and new coach Alan Jones. The 1984 Wallabies became the first team from Australia to achieve a Grand Slam by defeating all four Home Nations: England, Ireland, Wales and Scotland, and a strong Barbarians side. The tour signalled the emergence of Australia as a serious force on the world stage. Many records were established on the tour including; 100 points being scored in the four Tests—the most scored by a touring team to the United Kingdom and Ireland, the first ever push-over try conceded by Wales in Cardiff, Mark Ella scoring a try in each match – a feat never before achieved. In 1986 Australia toured New Zealand in a three match series for the Bledisloe Cup. New Zealand rugby was in turmoil as an unofficial team named The Cavaliers that contained the bulk of the All Blacks players toured South Africa. On return those All Blacks who had toured with The Cavaliers were banned from selection for the first Bledisloe Test. Australia went on to win the first match by 13–12. The ban on players was lifted for the second Test which was played on 23 August 1986 at Carisbrook. New Zealand squared the series 1–1 by winning the match 13–12. The match included controversy when Welsh referee Derek Bevan disallowed a try by Australia number eight Steve Tuynman. The final match was played on 6 September 1986 at Eden Park. Australia beat a full strength New Zealand team 22–9 to secure their first series win on New Zealand soil. Australia went into the inaugural Rugby World Cup in 1987 confident. However, the semi-final against France at Sydney's Concord Oval, was lost 30–26. Australia then lost the third-fourth play-off match against Wales. While Australia's performances over the three years under coach Alan Jones were of a high standard, Jones had a polarising effect on the team with many players unhappy with his management style. Mark Ella, who retired after the 1984 season, stated that he might not have retired had Jones not been coach. Notably, there were deep ructions between coach Alan Jones and influential half-back Nick Farr-Jones. Before and during the 1987 World Cup Alan Jones increased his activities outside coaching Australia, including radio broadcasting. Following the World Cup Jones was removed as coach and Bob Dwyer—who had coached Australia in 1982 and 1983—returned to coach in 1988. In 1989 the British and Irish Lions toured Australia for the first time since 1966. After winning the first Test, Australia lost the second and third matches to lose the series 1–2. Bob Dwyer identified a lack of forward dominance as a major factor contributing to the loss and entered the 1990s with an aim to improve this facet of the Wallaby game. The team regrouped and then went into the 1991 World Cup with a renewed attitude. In the pool games they beat Argentina, cruised to a 38–3 win over Wales, and beat Samoa 9–3 in a rain soaked game. During the quarter-final match against Ireland, Australia were never able to pull away from them. With literally seconds remaining on the clock, Ireland were up 18–15 before Michael Lynagh scored in the corner to break the hearts of the Irish and qualify for the semi-final against New Zealand. In the first half they raced to a 13–3 lead and then showed they could defend as the All Blacks pounded their line. They faced England in the final at Twickenham. England changed their usually forward-dominated game plan and attempted to play more of a running game. It was unsuccessful and Australia battled out a 12–6 win. David Campese was named player of the tournament having scored six tries in a series of outstanding performances. Victory parades were held back in Australia for their national team. The decade was one of the most important in the creation of the modern game. Australia's defence of the World Cup in South Africa in 1995 opened with defeat by the home side. Pool play was followed by an exit in the quarter-final against England courtesy of a long-range drop-goal from the boot of Rob Andrew. This was Australia's worst ever World Cup result, on a par with Australia's unexpected exit from the 2007 campaign at the quarter-final stage, also against England. The Tri-Nations and Super 12 tournaments were established that year, and started in 1996. This pushed the game into professionalism. In response to rugby's move to professionalism, the Rugby Union Players Association (RUPA) was established in October 1995 to safeguard the interests of Australia's professional rugby players. Greg Smith was national coach in 1996 and 1997 when Australia only won two of their eight Tri-Nations Tests, both over South Africa in Australia, and suffered record-margin Test defeats by the All Blacks and Springboks. Rod Macqueen was appointed as Smith's successor and in 1998 Australia won both their Tests over the All Blacks to gain the Bledisloe Cup. They retained the Bledisloe in 1999 when they defeated the All Blacks by a record 28–7 in Sydney. In 2000 Australia retained the Bledisloe Cup, and won the Tri Nations for the first time. They repeated this in 2001 and also achieved their first ever series win over the British and Irish Lions. MacQueen, and captain John Eales both retired soon after this. They were replaced by coach Eddie Jones and captain George Gregan. This period also saw big-money signings of top-level rugby league footballers Mat Rogers, Wendell Sailor, and Lote Tuqiri—all of whom went on to represent Australia. This was a contrast to much of the previous century where many Rugby union players were lured to league with large salaries. After not retaining the Tri-Nations in 2002, and losing the Bledisloe Cup in 2003 Australia made a strong start to their 2003 World Cup campaign with a 24–8 win over Argentina, and two large victories over Namibia and Romania. They then narrowly defeated Ireland 17–16 and Scotland 33–16, in the quarter-final. They claimed one of their greatest victories over New Zealand when they upset them in the semi-final winning 22–10, prompting George Gregan to taunt the New Zealanders with the words "Four more years boys, four more years". They played England in a thrilling final and were finally beaten after England's Jonny Wilkinson kicked a drop goal in extra time. In 2005 to celebrate the ten-year anniversary of the professionalism of rugby union the Wallaby Team of the Decade was announced. John Eales being named captain by a selection panel of 30. Following the 2005 European tour, media outlets such as the Daily Telegraph called for the sacking of both Eddie Jones and George Gregan. Former coach Alan Jones also called for their sacking. The record of eight losses from their last nine Tests resulted in Jones being fired by the Australian Rugby Union. John Connolly was named as the head-coach of Australia in early 2006. Australia won both of two Tests against England in 2006, as well as a subsequent win over Ireland. Australia lost by 20 points in their opening Tri-Nations fixture against the All Blacks. They then beat South Africa in Brisbane by 49–0. They won one of their remaining four matches of the tournament. Following defeat by England in the Quarter-Finals of the 2007 Rugby World Cup, Connolly announced he was resigning as head-coach. Robbie Deans was appointed head coach in early 2008 as the Wallabies began their preparations for the 2008 Tri-Nations series. After the retirement of George Gregan and Stephen Larkham after the 2007 Rugby World Cup, Deans had the task of choosing a squad minus some of its most experienced players. The Wallabies had mixed results in the 2008 Tri Nations Series, defeating New Zealand in Sydney and beating South Africa twice, in both Perth and Durban. However, the Wallabies suffered the worst defeat in their history, going down 53–8 to South Africa in Johannesburg. 2009 was not a good year for the Wallabies. It was a good start for them as they defeated the Barbarians 55 – 7 and then beat Italy in both tests and finishing off the Mid year test series with a 22 – 6 win over France. It went downhill from there as they finished 3rd in the Tri Nations with 3 losses to the All Blacks (22 – 16, 19 – 18 and 33 – 6) and 2 losses to the World Champion Springboks (29 – 17 and 32 – 25). Their only win in the Tri Nations was a 21 – 6 win over the Springboks. In the Autumn Internationals of 2009, they lost to All Blacks 32 – 19, they beat England 18 – 9 on Jonny Wilkinson's return in the English jersey. The Wallabies then drew with Ireland 20-all after Brian O'Driscoll's last minute try to give Ronan O'Gara a relatively easy conversion to draw level. They then lost to Scotland for the first time in 27 years. The final score was 9 – 8 despite the 3 – 3 score at half time. The Wallabies only won 7 out of their 14 games in 2009 but were still ranked 3rd in the world. 2010 saw improved results in the Tri-Nations series, with a very rare away win against South Africa awarding Australia the Mandela Plate and ensuring they retained second place both in the 2010 Tri-Nations competition as well as the IRB World Rankings. However, they suffered their tenth consecutive defeat at the hands the All Blacks, an all-time record. Later that year however, Australia finally beat New Zealand in a thrilling game that was played in Hong Kong. It was their first win against the All Blacks in close to three years. However they suffered losses against England and Munster on their end of year European tour. Australia's 2011 season began with a shock loss to Manu Samoa in Sydney, (23-32) but they would go on to win that year's Tri-Nations series; a tournament which they had not won in ten years since the 2001. They however failed the following season in their attempt to win the expanded version of the competition in 2012 called The Rugby Championship. Following the Wallabies defeat to the British and Irish Lions in their 2013 tour, and with a winning rate of 58.1%, a poor 3-15 record against the All Blacks, Deans came under increasing pressure to keep his coaching position. On July 2013, Deans resigned, ending his six-year tenure as head coach of the Wallabies. During his tenure, Deans coached the Wallabies on 74 occasions winning 43 times, losing 29 and drawing twice. He had won just 3 times against their main rivals, the All Blacks, with 1 draw in 2012. However, he left with a good record against the Springboks, with 9 wins from 14. Highlights during his tenure as coach included leading the Wallabies to a Tri Nations championship in 2011 and to a 3rd-place finish in the 2011 Rugby World Cup. On 9 July 2013, Queensland Reds coach Ewen McKenzie was officially named Wallabies coach to replace Robbie Deans. McKenzie's first match in charge was a 47–29 loss to New Zealand in the opening fixture of the 2013 Rugby Championship. In this match he gave 5 debutants their first cap. The 27–16 loss a week later, meant the Bledisloe Cup would stay with New Zealand for the 11th year in a row. In addition to this, McKenzie led to team to a 38–12 loss to South Africa, the biggest ever winning margin by South Africa over Australia in Australia. The 14–13 win over Argentina was McKenzie's first victory as an international coach, but the scoreless second half was the first time Australia had failed to score points in the second half since the home test v New Zealand in 2005. Australia's poor form in the Championship continued against South Africa, where Australia lost 28–8 in Cape Town. However, Australia's final fixture of the Championship saw the Wallabies earn their first bonus point win in the Championship and saw them score the most points in either the Rugby Championship / Tri Nations. During the Championship, McKenzie made several bold moves as a coach. He dropped star player Will Genia for Nic White, who at the time had only 3 caps, and named Ben Mowen as captain in his first year as a test player. During the Bledisloe 3, New Zealand won 41–33 to win the Bledisloe series 3–0. During their 2013 end of year tour, McKenzie led the team to 4 consecutive wins (50–20 win over Italy, 32–15 win over Ireland, 21–15 win over Scotland and a 30–26 win over Wales) which was the first time Australia has done this since 2008. But Australia lost 20–13 to England in the opening match of the tour. However, during the tour Australia did retain the Lansdowne Cup, reclaimed the Hopetoun Cup and claimed the James Bevan Trophy for the 6th time in a row. In 2014, their 4 consecutive wins were increased to 7 for the first time since 2000. They earned a 3–0 test series win over France during the June International Window, which included a 50–23 win in Brisbane, a 6–0 win in Melbourne and a 39–13 win in Sydney. The series win meant Australia reclaimed the Trophée des Bicentenaires for the first time since 2010, after losing it in 2012. The Wallabies's unbeaten run stretched to 8 matches with a 12-all draw with New Zealand, prompting optimism that Australia could finally reclaim the Bledisloe Cup for the first time since 2002, in addition to ending their 28-year winless run at Eden Park. However, Australia came crashing back to earth, suffering a 51-20 defeat during the second Bledisloe test, staged at the venue, stretching Australia's Bledisloe Cup drought to a 12th year. Australia managed to bounce back from that defeat, with hard fought 24-23 and 32-25 wins over South Africa and Argentina, with the latter win ensuring that Australia retained the Puma Trophy. However, Australia was unable to reclaim the Mandela Challenge Plate, suffering a 28-11 loss to South Africa, after conceding 3 tries and a drop goal in the final 11 minutes of the match. A week later, Australia suffered a 21-17 loss to Argentina, their first loss to Argentina in 17 years. This loss meant that Australia became the first country to lose to Argentina in the Rugby Championship since Argentina's admittance in 2012. For the second consecutive year, Australia finished in third place in the Rugby Championship. On 18 October 2014, McKenzie resigned as the head coach of Australia. He left the Wallabies with 11 wins in 22 tests coached, for a winning percentage of just 50%. McKenzie left with a good winning record against European opposition, winning 7 of 8 tests played, the lone loss coming against England in November 2013. He also left with a good winning record against Argentina, with a 3-1 win-loss record. However, he left with a poor record against Rugby Championship opponents, failing to win a match against New Zealand and leaving with a 1-3 win-loss record against South Africa. In 2015 it was time for the Rugby World Cup. Australia was in "the pool of death" alongside Wales, Fiji, England and Uruguay. 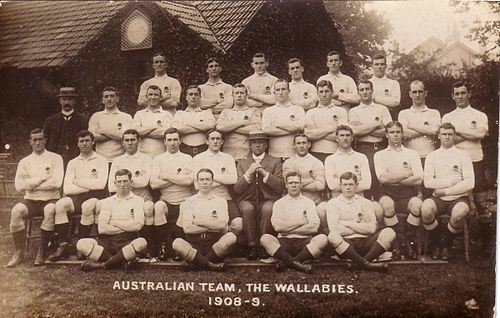 The Wallabies first match was against Fiji which Australia won 28 - 13. Then Australia slaughtered Uruguay 65 - 3. In the third round Australia defeated England at Twickenham 33 - 13, eliminating the host nation from their own World Cup. In the last pool match Australia luckily defeated Wales 15 - 6. In the Quarter finals they scraped a controversial  win over Scotland by 35 - 34. They then defeated Argentina in the Semi finals which took them to the Grand Final against New Zealand, which they lost 34 - 17. 2016 went badly for the Wallabies, the beginning of a severe downward trend in their results. In June the Australians hosted a three-test series against Six Nations winners England, coached by former Wallabies overseer Eddie Jones. England won all three games, by 39-28, 23-7 and 44-40 respectively. Although they finally finished in 2nd place, with two wins over Argentina and one over South Africa, they lost both games against New Zealand in the Rugby Championship plus the third Bledisloe test that year, continuing a miserable run against their trans-Tasman rivals. In the end of year internationals, Australia managed wins against Wales (32-8), Scotland (23-22) and France (25-23), but lost to Ireland 27-24 before losing a fourth game against England by 37-21. The following year saw little improvement. In the 2017 June internationals Australia secured wins against Fiji (37-14) and Italy (40–27), but lost against a Scotland side missing a number of players on duty for the British and Irish Lions. Their form continued into the 2017 Rugby Championship where, despite again finishing 2nd in the table, they only won their two games against Argentina, lost both matches against New Zealand and struggled to two draws against a poor South Africa. Although they pulled off a surprise 23-18 win in the third Bledisloe test that year, in their autumn test season they only achieved wins against Japan (63-30) and Wales (29-21) before suffering a fifth straight defeat to England 30-6 and a crushing, record-setting loss to Scotland by 53–24. 2018 was one of the worst years ever for Australian rugby  . In the June series against Ireland, Australia won the first test 18-9, but lost the remaining matches 21-26 and 20-16 despite outscoring the Six Nations Grand Slam holders by five tries to three. The home series loss to Ireland was Australia's first since 1979. In that year's Rugby Championship Australia again lost both matches against arch-rivals New Zealand. Although they secured a hard-fought 23-18 victory against South Africa in Round 2, they subsequently lost to Argentina at home for the first time since 1983, as well as the return fixture to South Africa 23-12. Their third win of the year was against Argentina where, despite losing the first half 31-7, the Wallabies pulled off an astonishing second-half comeback to win the match 45-34. In the final Bledisloe test, played at Yokohama stadium in Japan, the Wallabies were again trounced by New Zealand 37-20. That autumn, Australia suffered their first defeat to Wales in 10 years by 9-6. The scoreline of the Welsh game, as well as the result, exactly mirrored that of the first meeting between the sides 110 years earlier. They defeated Italy 26-7 the following week, before falling to a sixth defeat to England by 37-18 the week after. The Wallabies finished 2018 having won only four games from thirteen tests played, marking that year as their direst run of results in the professional era, and their worst calendar year since 1958  . The away jersey usually is green or white, although in the 1995 Rugby World Cup, the Wallabies wore in the match against Romania a green and yellow hooped jersey, with green shorts and socks. In 2010, KooGa became the apparel sponsor. The first KooGa jersey for the Wallabies under KooGa was used from 2010 through to the conclusion of the 2012 season, however, a different set of shorts and socks were made for the 2012 season. A new kit designed by KooGa was revealed in 2013 for the series against the British and Irish Lions. BLK Sport, previously the Australian subdivision of KooGa, became the apparel sponsor after that tour, with the BLK logo replacing the KooGa logo on the kit for the 2013 Spring Tour. In October 2013, the ARU announced that Asics would be the apparel sponsor beginning in 2014. In the third 2017 Bledisloe Cup test, for the first time, the Wallabies played with an indigenous jersey. ↑ Sponsored logos appear on jerseys for matches other than the Rugby World Cup where branding, except for logos of equipment manufacturers, is not allowed. ↑ BLK brand apparel was supplied for the 2013 end-of-year tour. The team mascot is known as Wally. Australia has appeared at every Rugby World Cup since the first tournament in 1987. Australia was the first nation to win two World Cups, with victories in 1991 and 1999. They have progressed to four Rugby Union World Cup finals, a record jointly held with New Zealand. In 1987, Australia co-hosted the inaugural Rugby World Cup with New Zealand. They were grouped with England, the United States and Japan in Pool A. In their first ever World Cup match, Australia defeated England 19–6 at Concord Oval in Sydney then went on to beat their other pool opponents to finish the top of their group and advance to the quarter finals where they defeated Ireland 33–15. They were knocked out by France in the semi-finals, and then lost the third place match against Wales. Coached by Bob Dwyer for the 1991 World Cup in Europe, Australia again finished at the top of their pool, defeating Western Samoa, Wales and Argentina during the group stages. They met Ireland in the quarter finals, beating them by one point to go through to the semi-finals, where they defeated the All Blacks 16–6 to qualify for their first World Cup final. Australia beat England 12–6 at Twickenham in the 1991 Rugby World Cup Final to become world champions. Australia were again automatically qualified for the 1995 World Cup in South Africa and finished second in their pool, losing one game to hosts South Africa. They were then knocked out in the quarter finals by England. In the 2009 feature film Invictus based on the story of the 1995 tournament, Australia can be seen playing South Africa in one of the scenes. Rod Macqueen was the Australian head coach for the 1999 World Cup in Wales. The team beat Ireland, Romania and the United States during the group stages and, after defeated hosts Wales in the quarter-finals, they turned the tables on defending champions South Africa, beating them 27–21 to make it to the final. There they defeated France 35 to 12, in the 1999 Rugby World Cup Final and becoming the first nation to win the World Cup more than once. Australia were the sole hosts of the tournament in 2003, and went undefeated in Pool A, beating Ireland, Argentina, Romania and Namibia. Australia defeated Scotland in the quarter finals, and then the All Blacks in what was regarded as an upset in the semi-finals, to go to the final. England won the final in Sydney during extra time with a Jonny Wilkinson drop goal. The 2007 World Cup in France was not a successful tournament for the Wallabies. While they finished on top of their group in the pool stages, Australia was knocked out by England 12–10 in their quarter final, again largely due to Jonny Wilkinson's goal-kicking prowess. This loss was widely regarded as an upset, given England had only finished 2nd in their pool and were ranked 7th. Nevertheless, England went on to upset hosts France in their semifinal match, and advanced to the final where they were beaten by South Africa. Australia's main annual tournament is The Rugby Championship (formerly the Tri-Nations from 1996 to 2011), competing with New Zealand, South Africa and Argentina who joined in 2012. Australia has won the tournament four times; in 2000, 2001, 2011 and 2015. Within the Rugby Championship, Australia also competes for the Bledisloe Cup with New Zealand, the Mandela Challenge Plate with South Africa, and the Puma Trophy with Argentina. Australia contests a number of other trophies against tier one teams from the Northern Hemisphere. The Trophée des Bicentenaires has been contested with France since 1989; the Cook Cup with England since 1997; the Hopetoun Cup with Scotland since 1998; the Lansdowne Cup with Ireland since 1999; and the James Bevan Trophy with Wales since 2007. Up until 2015, to be selected for the Wallabies, eligible players had to play for an Australian Super Rugby franchise, and eligible players playing outside of Australia were not able to be selected. On 16 April 2015, it was announced that the ARU would tweak their selection policy, so that certain players could ply their trade in the Japanese Top League competition from August to February, as long as they continued to play for a Super Rugby franchise from February to August, making them eligible for Wallaby selection as they would also be still playing in Australia. However, this "flexible contract" would only be given to a select number of players considered by the head coach and the ARU board, which means not all players playing or transferring to Japan would be allowed to play in the Top League and the Super Rugby. As the Top League competition clashes with some Wallaby test matches, Wallaby selectors would use World Rugby's regulation 9 (clubs must release players within international windows) to select these players when the Top League clashes with the Rugby Championship in August through to October, and the end-of-year tour in November. At this point, players playing in Europe were not considered for the flexible contract, as too much of the European season clashes with Wallaby test matches. However, on 22 April 2015, further changes were made to the original selection policy in order for some European based players to be selected. In addition to the flexible contract, Australian players playing anywhere in the world can be selected for the Wallabies as long as they fit a certain criteria - A player must have held a professional contract with Australian rugby for at least seven years, and have played 60 tests or more for an overseas based player to be selected. Further more, if a player does not fit this criteria and plays overseas, but chooses to return to Australia, they become immediately eligible for selection as long as they have signed at least 2 years with the Australian Super Rugby franchise for the following season. Like the flexible contract, Wallaby selectors would use World Rugby's regulation 9 to select overseas based players anywhere in the world. As of August 2018 [update] , the Wallabies have fourteen former players (and two former coaches) in the World Rugby Hall of Fame, which was previously known as the IRB Hall of Fame prior to 2015. Gregan, a World Cup-winning scrum-half whose Test career spanned the amateur and professional eras of the sport (1994–2007), is notable as having been the all-time caps leader in international rugby union, with 139 in all (a record since surpassed by Brian O'Driscoll of Ireland). He also captained the Wallabies in 59 Tests. Former captain George Gregan is Australia's most capped player with 139 Test caps. Gregan was also the world's most capped player until being surpassed by Ireland's Brian O'Driscoll in 2014. Gregan also equalled the record for the most caps as captain with Will Carling, 59 caps (a record later to be broken by John Smit of South Africa). David Campese scored 64 Test tries in his career, which was a world record until Daisuke Ohata of Japan overtook him with 69 tries, and Michael Lynagh was the highest Test points scorer in world rugby with 911 until Neil Jenkins of Wales overtook him with 1037 points. Rocky Elsom scored the fastest forward hat-trick in World Cup history. Australia's most-capped forward is lock Nathan Sharpe, who retired from international rugby after the 2012 end-of-year Tests with 116 caps. The longest winning streak by Australia was produced in the early 1990s, and started at the 1991 World Cup in England, with three pool wins, and subsequent quarter-final and semi-final victories over Ireland and the All Blacks respectively. This was followed by the win over England in the final. The streak continued into the following year, for two matches against Scotland and the All Blacks, lasting in total, 10 games. Similarly, the Australian record for losses in a row is also 10 games, which was sustained from a period from 1899 to 1907, including two British Isles tours, and losses to the All Blacks. The largest winning margin for Australia was produced at the 2003 World Cup, in which they defeated Namibia 142 points to nil during the pool stages, the match is also the largest number of points scored by Australia. The largest loss was against South Africa, who beat Australia 53 points to 8 in 2008. The current head coach is Michael Cheika who was appointed on 22 October 2014, following Ewen McKenzie's shock resignation. He is assisted by former Wallabies Nathan Grey as defence coach, Stephen Larkham as attack coach, and former Fijian international Simon Raiwalui as forwards coach. The opening match of the 2003 World Cup at Telstra Stadium. The Wallabies play at a variety of stadiums around Australia. Some of these include Stadium Australia in Sydney, Lang Park in Brisbane, AAMI Park and Docklands Stadium in Melbourne, and Optus Stadium and nib Stadium in Perth. A variety of venues were used around Australia for the 2003 Rugby World Cup matches. Some of the earlier stadiums that were traditionally used for Wallabies matches, included Sydney's Concord Oval and the Sydney Cricket Ground (SCG) and Sports Ground, as well as Ballymore and the Exhibition Ground in Brisbane. It was the SCG that hosted the first ever Australian international, against Great Britain, in 1899. The Wallabies rugby internationals and spring tour were televised by Network Ten between 1992-1995 and since 2013. Since 1996, Fox Sports have televised them. They jointly televised them with Seven Network between 1996-2010, Nine Network in 2011-2012. Wallabies internationals are protected by Australia's anti-siphoning laws, meaning that all Wallabies matches must be offered to a free-to-air network. ↑ "World Cup 1991". London: BBC Sport. 18 November 2003. Retrieved 21 May 2007. ↑ "1899 – Australia". lionsrugby.com. Archived from the original on 27 September 2007. Retrieved 25 July 2007. ↑ "The English Footballers. England v. Australia". The Sydney Morning Herald. 24 June 1899. Retrieved 24 December 2013. ↑ "History of the Australian Jersey". Australian Rugby Union. Archived from the original on 14 October 2013. Retrieved 24 December 2013. ↑ "The New Zealand Footballers: Match Against Australia". The Sydney Morning Herald. 17 August 1903. p. 7. Retrieved 16 September 2015. 1 2 "History". Australian Rugby. Archived from the original on 3 July 2011. Retrieved 16 September 2015. ↑ "Australian rugby". bbc.co.uk. Retrieved 5 August 2006. ↑ Reason (1979), pg 58. ↑ Fagan, Sean. "Club Histories – New Speculations". Archived from the original on 21 October 2006. Retrieved 25 July 2007. ↑ "Kangaroos v. Wallabies". West Coast Times. New Zealand. 6 September 1909. p. 4. Retrieved 3 December 2009. ↑ "278th All Black Game". rugbymuseum.co.nz. Archived from the original on 14 June 2011. ↑ "Sir Nicholas Shehadie AC OBE". Australian Rugby Union. Archived from the original on 1 February 2008. Retrieved 22 May 2007. ↑ "All set for World Cup semis". worldcupweb.com. 14 November 2003. Archived from the original on 11 November 2006. Retrieved 15 November 2006. ↑ "The Wallabies still have a quarter final spot to earn: Deans - thetelegraph.com.au". ↑ "Rugby World Cup - All Blacks out-muscle Wallabies,... - Stuff.co.nz". ↑ "BBC Sport - Rugby Union - Rugby World Cup 2011: Wales 18-21 Australia - as it happened". ↑ "Australia coach Robbie Deans resigns following Lions defeat". BBC Sport. ↑ "Robbie Deans steps down as Wallabies coach". ↑ ABC News. "Australian Rugby Union confirms Robbie Deans 'stood down' from Wallabies job on Monday". ABC. News. Retrieved 9 July 2013. ↑ "All Blacks put Wallabies to the sword". ESPN scrum. ↑ "All Blacks retain Bledisloe Cup". ESPN scrum. ↑ "Springboks embarrass Wallabies". ESPN scrum. ↑ "Wallabies finally win under Ewen McKenzie". ESPN scrum. ↑ "Springboks too good for Australia". ESPN scrum. ↑ "All Blacks score last gasp win over Wallabies in Bledisloe Cup; Ewen McKenzie resigns". ABC News. ↑ ESPN Staff. "Australia: Ewen McKenzie resigns from Wallabies role - Live Rugby News - ESPN Scrum". ESPN scrum. ↑ "Wallabies beat Barbarians 40-36 to kick off European Rugby Tour and Michael Cheika's tenure". ABC News. ↑ "Wallabies hang on to beat Barbarians at Twickenham to start Michael Cheika's tenure with a win". The Sydney Morning Herald. ↑ "Bernard Foley leads Wallabies to tight win against Wales". The Sydney Morning Herald. ↑ "Wallabies post 10th straight win over Wales with 33-28 triumph at Millennium Stadium". ABC News. 1 2 "Wallabies fall to lowest-ever ranking of sixth ahead of Rugby World Cup". Australian Broadcasting Company. Retrieved 17 March 2015. 1 2 3 4 5 "History of the Australian Jersey". Australian Rugby Union. Archived from the original on 7 August 2007. Retrieved 14 August 2007. ↑ "The Wallabies New World Cup Jersey...ouch..." rucksandrolls.com. 25 June 2007. Archived from the original on 27 June 2007. Retrieved 26 July 2007. ↑ Growden, Greg (13 July 2007). "Just one big Boks of contradictions". rugbyheaven.smh.com.au. Archived from the original on 15 July 2007. Retrieved 26 July 2007. ↑ "KooGa appointed apparel sponsor for Qantas Wallabies from 2010". Australian Rugby Union. Archived from the original on 30 October 2009. Retrieved 28 November 2009. 1 2 3 4 "A brief history". Australian Rugby Union. Archived from the original on 14 August 2007. Retrieved 14 August 2007. ↑ "International Teams > Australia > Teams Played". rugbydata.com. 26 May 2007. Retrieved 26 May 2007. ↑ "ARU allows senior overseas-based players to be considered for Wallabies". 22 April 2015. ↑ "ARU will select overseas-based players for Wallabies and World Cup - Fox Sports". www.foxsports.com.au. ↑ Rugby News Service (21 October 2007). "Habana named IRB Player of the Year". International Rugby Board. Archived from the original on 23 October 2007. Retrieved 21 October 2007. 1 2 "RWC legends inducted into IRB Hall of Fame" (Press release). International Rugby Board. 26 October 2011. Archived from the original on 27 October 2011. Retrieved 13 March 2012. ↑ "Legends inducted into IRB Hall of Fame" (Press release). International Rugbhy Board. 18 November 2013. Archived from the original on 3 December 2013. Retrieved 1 December 2013. ↑ "IRB Hall of Fame 2013 Induction: "The British & Irish Lions and Australia"" (PDF). International Rugby Board. Archived from the original (PDF) on 29 October 2013. Retrieved 2 December 2013. ↑ "Rugby greats to join definitive Hall of Fame" (Press release). International Rugby Board. 31 July 2014. Archived from the original on 12 August 2014. Retrieved 10 August 2014. ↑ "Richards, Thomas James (Tom) (1882 - 1935)". www.adb.online.anu.edu.au. Retrieved 29 October 2010. ↑ Zavos, Spiro (8 August 2008). "Dan Carroll: rugby's greatest Olympian". TheRoar.com.au. ↑ Tiernan, Eamonn (11 August 2018). "Wallabies great Stephen Larkham reflects on Hall of Fame induction". The Sydney Morning Herald. Archived from the original on 12 August 2018. Retrieved 12 August 2018. ↑ Sheek (10 August 2011). "Wallabies coaches since 1962: Part I". The Roar. Archived from the original on 4 March 2016. Retrieved 19 January 2015. ↑ Sheek (10 August 2011). "Wallabies coaches since 1962: Part II". The Roar. Archived from the original on 29 August 2012. Retrieved 19 January 2015. ↑ "ARU signs BMW as official partner". www.rugby.com.au. Retrieved 2015-09-21. ↑ "BMW Australia". bmw.com.au. Archived from the original on 4 October 2015. Retrieved 2015-09-21. Fagan, Sean (2005). The Rugby Rebellion – The Divide of League and Union in Australasia. RL1908. ISBN 1-903659-25-6. Hickie, Thomas (1993). They Ran With the Ball – How Rugby Football Began in Australia. Longman Cheshire. ISBN 0-582-91062-5. Reason, John; James, Carwyn (1979). The World of Rugby – A History of Rugby Union Football. British Broadcasting Corporation. ISBN 0-563-16280-5. Wikimedia Commons has media related to Australia national rugby union team . George Musarurwa Gregan AM is a retired Australian rugby union player, and is currently Australia's highest ever internationally capped player. Richard Hugh McCaw is a retired New Zealand rugby union player. He captained the national team, the All Blacks, in 110 out of his 148 test matches, and won two Rugby World Cups. He is the most capped test rugby player of all time, and has won the World Rugby player of the year award a joint record three times. Simon Paul Poidevin is a former Australian rugby union player. Nicholas Campbell Farr-Jones AM is a former Australian rugby union footballer. His position was scrum-half. He is probably best remembered for winning the 1991 Rugby World Cup with his team against England. He now works at Taurus Funds Management, appears as a TV rugby commentator on UK Sky Sports and is the chairman of the New South Wales Rugby Union. Stephen William Hansen, and High Chief Of Vaiala, is a New Zealand rugby union coach and former rugby union player. He is currently the head coach of the All Blacks. Ewen James Andrew McKenzie is an Australian professional rugby union coach and a former international rugby player. He played for Australia's World Cup winning team in 1991 and earned 51 caps for the Wallabies during his test career. McKenzie was head coach of the Australian team from 2013 to 2014. He has coached in both southern and northern hemispheres, in Super Rugby for the Waratahs and Reds, and in France at Top 14 side Stade Français. During his playing days he was a prop and, in a representative career spanning from 1987 to 1997, he played nine seasons for the NSW Waratahs and two for the ACT Brumbies. Israel Dagg is a former New Zealand rugby union player who played for the Crusaders in Super Rugby. He has also played for the New Zealand Sevens team, and represents Hawkes Bay in the ITM Cup. Matthew Papali’i To'omua is an Australian rugby union player who has played over 35 times for Australia since 2013. He plays for the Leicester Tigers in England's Premiership Rugby competition and his usual position is at fly-half or inside centre. Colin "Col" Windon, was a rugby union player and soldier who captained Australia – the Wallabies – in two Test matches in 1951. By age 18 Windon was playing at flanker for his club Randwick in Sydney's Shute Shield. After serving with the Second Australian Imperial Force in the Pacific Theatre during the Second World War, Windon resumed his rugby career in 1946. He was first selected for Australia for their tour of New Zealand that year. Despite the Wallabies losing both their Tests on tour, Windon impressed with his play. Owen Thomas Franks is a New Zealand rugby player who plays for the Crusaders in the Super Rugby competition and New Zealand at international level. He made his debut for New Zealand in 2009 and has since won 105 caps. He was a member of the squads that won the 2011 and 2015 Rugby World Cups, and is one of only twenty dual Rugby Union World Cup winners. In February 2019, it was announced he will join English Premiership club Northampton Saints for the 2019/20 season onwards. Brodie Allan Retallick is a New Zealand rugby union footballer, who currently represents the All Blacks in international rugby, as well as the Chiefs in Super Rugby, having worked his way there by playing for the Hawke's Bay Magpies in the Mitre 10 Cup. His regular playing position is lock. He was a key member of 2015 Rugby World Cup winning team. Retallick was the winner of World Rugby Player of the Year in 2014 and is the award's youngest winner to date. Liam Ivan John Squire is a New Zealand rugby union player from Tokomaru, New Zealand. He currently plays in the number 8 and blindside flanker position for the All Blacks, Otago-based Super Rugby team Highlanders, and provincial side Tasman. The 2013 Australia national rugby union team tour of Great Britain, Ireland and Italy was a rugby union tour between the away team Australia and the homes teams of England, Ireland, Italy, Scotland and Wales. They also played an additional Test match against New Zealand, which acted as the third and final Bledisloe Cup match for 2013. The History of the South Africa national rugby union team dates back to 1891, when the British Lions first toured South Africa where they played against South African representative sides. The South Africa national rugby union team played few international matches during a period of international sanctions due to apartheid. Since the end of apartheid in 1990–91, South Africa has once again fully participated in international rugby.